The geometric of a wind turbine rotor is an important parameter in the development of a horizontal axis wind turbine (HAWT). Simulation can be used to determine the rotor’s optimum geometry for specific wind speeds. The present study describes the three-dimensional (3D) computational fluid dynamics (CFD) simulation of a modified small-scale NACA-4415 HAWT rotor in order to predict power output and coefficient, using Blade Element Momentum (BEM) based on Lifting Line Theory (LLT). Power output and coefficient were analysed at wind speeds of 3, 4, 5, 6, and 7 m/s. The results predict that maximum power output increases with increasing wind speed. The predicted minimum power output of 35.41 Watt was obtained at wind speed 3 m/s and Tip Speed Ratio (TSR) 4; the predicted maximum power output was achieved at wind speed 7 m/s and TSR 6. As in the case of power output, power coefficient also improved with rising wind speed, with a coefficient of 0.259 at wind speed 3 m/s and TSR 4 and a coefficient of 0.449 at wind speed 7 m/s and TSR 5. Given Indonesia’s typical wind speed of 4 to 5 m/s, this modified NACA-4415 rotor is predicted to generate between 92 and 255 Watts of power. The power output results show good agreement between simulation and experiment, with an R2 value of 0.93. As predicted by Sugianto (2016), Indonesia has an approximate wind energy potential of 9.29 GW. Only 500 kW of this potential has been utilized, but it can be optimized by means of a wind turbine energy conversion system. To optimize the design of a wind turbine rotor, it is necessary to consider wind speed characteristics. In Indonesia, wind speed typically ranges from 3 to 7 m/s. An average wind speed of 5 m/s requires a HAWT (Sugianto, 2016). To design a suitable wind turbine for a specific wind velocity, the geometry of the rotor blade (or airfoil) must also be optimal. Figures 1a and 1b illustrate the nature of airfoil aerodynamics in schematic form. Localized pressure (p) and shear force (?) on the airfoil (Figure 1a) impacts aerodynamic forces that include normal forces (N), lift force (L) and drag force (D) as shown in Figure 1b. 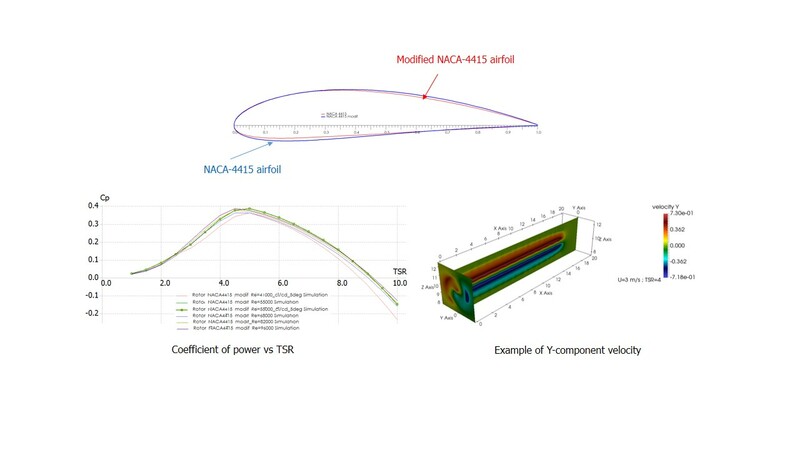 It can be concluded that the simulation was effective in predicting the power output of a small-scale HAWT based on a modified NACA-4415 airfoil. The rotor is predicted to generate power in the range of 92–255 Watts at a typical Indonesian wind speed of 4 to 5 m/s, with a high correlation between simulation and experimental data (R2 = 0.93). This study was funded by Ministry of Research, Technology and Higher Education of the Republic of Indonesia, Directorate General of Strengthening Research and Development, and LLDIKTI V Yogyakarta with contract number: 061/HB-LIT/IV/2017, 14 April 2017. The author wish to thank Institut Sains & Teknologi AKPRIND Yogyakarta for the support.